The first in a series on recycling in Vermont. Here at the Chittenden Solid Waste District, we geek out on recycling. As municipal solid waste managers, it’s literally our job to be the local experts on how our community can best manage all the stuff we buy, use, and toss out. Plus, after 25 years of navigating recycling markets, we’ve steered through all kinds of waters: smooth, choppy, and even downright stormy, which is where we’ve been since 2013 when China started changing its policies on imported recycled scrap. Nearly every major media outlet has reported on these changes, and all of them have gotten much of it wrong. Recycling is way more complex than a dramatic headline. * What’s more, it isn’t the same everywhere in the world, the U.S., or even in New England! Even for recycling geeks, it’s a lot to wade through. 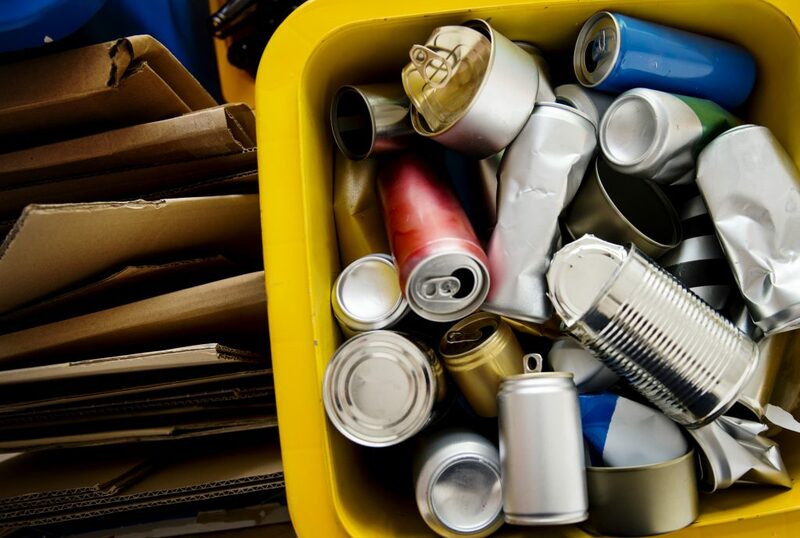 So, we decided to cut through the crazy and break down how recycling–specifically, “blue-bin” recycling—really does work in Chittenden County and Vermont. Step 1. Your family drinks all the milk. You rinse the jug, put the cap on, and toss it in the recycling bin with all your other recyclables. Step 2. Your trash and recycling hauling company picks up your recyclables or you bring them to a CSWD Drop-Off Center, and they go to CSWD’s Materials Recovery Facility—commonly called the MRF (rhymes with smurf)—in Williston. Step 3. The workers and equipment at the MRF separate all those recyclables into different groups. Your white jug joins other colored containers, like laundry detergent and shampoo bottles, made of the same type of plastic—HDPE. Milk jugs made from “natural” HDPE (the kind you can see the milk through), go in a separate bin with hundreds of others just like it. Step 4. The MRF sells your white jug in a 700-pound bale of colored HDPE for about $300.00 to $400.00/ton. The bale of natural HDPE sells for double that amount–about $750.00 to $850.00/ton. Both loads go to a plastics processor in the eastern United States, which shreds, washes, and turns the plastic into pellets. Step 5. A manufacturer buys the recycled HDPE pellets and uses them to make new bottles, drainage pipe, or maybe plastic pallets (for example). Step 6. Someone buys the new product, and the jug starts its new life! Even though recycling conserves resources when compared with making items from new or non-recycled materials, it clearly isn’t free. Every step in any recyclable’s life involves labor, transportation, and energy costs. That’s why reducing our consumption and extending product lifespans through reuse will always beat recycling when it comes to the overall environmental impact and sustainability of our choices. Still, recycling has a role to play, even for materials like a magazine or glass bottle, which have different stories to tell than the milk jug—stay tuned for those! The bottom line is that CSWD works hard to build North American markets for Vermont’s recyclables, because keeping recyclables out of the landfill is at the heart of our mission. There’s so much more to tell, we can’t wait to share it with you in our next installment. What do YOU want us to break down next? Send your questions to info@cswd.net, and if you want to see it all happening up close and in-person, come on a tour! Find out more about all our tours and workshops at www.cswd.net/learn. *Want a deeper dive into China’s role in global recycling markets? Check out this Resource Recycling timeline.